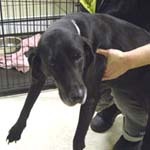 Rosebud is a lab mix, possibly blood hound who is spayed and wants very much to have a home. She came from an abuse case and then was fostered with dogs, cats and horses. She is very quiet, no hound barking, but she does like to sniff when she's outside. She's a doll! She will pull on leash so probably needs the fenced in yard if she is to go with someone whose not very strong. She weighs about 70 pounds and is very sweet and gentle. She's got a heart of gold and is an easy keeper. She's estimated to be between five and eight. Bruiser is a one year old male neutered Chihuahua. He came to us weighing only 3 lbs. and is up to 5 lbs. now. He loves to be held and loved on and fussed over. Loves to go "bye-bye" - ride in the car - sits on my shoulder while i drive... :) He is great with other dogs - male & female and large dogs too! He just got neutered so it should help with his marking and peeing everywhere. Right now he wears a belly band at all times when he's not sleeping in the bed at night or in crate while i'm away. (sleeping with you in the big bed is very important to him!) This dog WILL PEE and POOP in the house! he will need work on house training or trained for a doggy litter box. 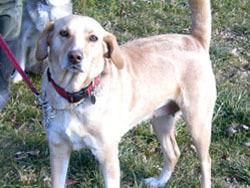 Cupcake is a 2 yr old spayed female Yellow lab X , white legs and blaze, approx 50 lbs. 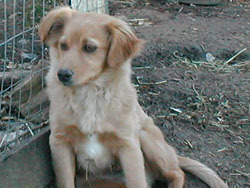 HISTORY- Cupcake was a barn dog on a farm in WV. The humane society vet visited in approx Oct 2006. She had 10 pups, which dwindled to 6 because they were getting run over by farm equipment. The vet took the dog and her pups when the farmer said he was thinking of shooting them all. The pups were all adopted by the humane society. The vet brought her to the humane society for adoption. HEALTH- Cupcake has excellent health. She is spayed, UTD on all vaccs, worming, Frontline, and has been HW tested. 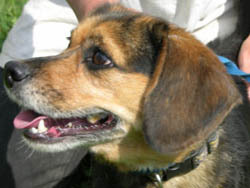 TEMPERAMENT- Cupcake is a delightful, sweet natured, friendly dog. Good with other dogs, cats, all people (and tho not seen with kids, I assume she'd be great.) She is a med/lower energy dog and seems content to rest quietly between walks, playtime, and meals, and when her owner is out. Absolutely ADORES food! Enjoys walks, romping with other dogs, rawhides and treats, and hunting field mice on walks. 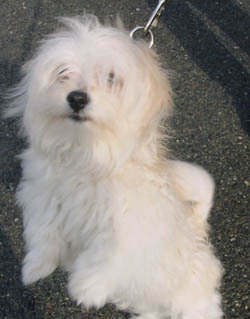 Jethro is a one year old male Maltese/Pom mix who was relinquished for lack of house training. He will be neutered and that should help him a great deal as we think he was marking his territory. He's adorably playful and just darling, weighing in at 8 lbs. He will be at our Meet and Greet on Sunday, the 21st at Especially for Pets in Wayland (junction 27/30) from 1-3 PM. This tiny male pup is about 10 weeks old and weighs maybe 10 pounds. He looks like a miniature shepherd. He has been around 2 little kids. and likes to be cuddled and loved on. He is very curious and playful. His name should be Lucky. 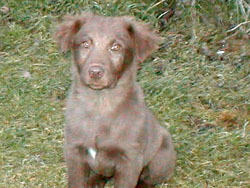 He was found on a rural road where all the other pups ran off into the woods and have never been caught. I'm sure they are no longer alive, so he is one Lucky puppy. Here is Kallie. She is about a year or so old and weighs 45 lbs. She was a WV stray. She is a quiet dog, an easy keeper, crate trained and probably house trained. Her mother is Kathy who is also in our care. We will be showing the dogs on Saturday, Jan. 13th from noon to 2 PM at Petco in Natick. It's best to fill out an online application before you come to the event so that we can have the printed copy waiting to review with you. Here is Kathy. She is the mommy to Kate and Kallie. A small boxer/Aussie x. She is 5 years old. around 50 pounds. Very sweet and lovable. Mellow. gets along with other dogs. She is a gorgeous dog who has had a rough life. She was pulled from a hoarder who had many dogs living in filth. Her coat is gorgeous, but missing some patches of fur due to a flea allergy. She is very quiet and well behaved, but will get into trash if left unattended as she had to forage for food in her previous life. She arrived on Sunday ad was seen by our vet and given a new health certificate two days later. We will be showing the dogs on Saturday, Jan. 13th from noon to 2 PM at Petco in Natick. It's best to fill out an online application before you come to the event so that we can have the printed copy waiting to review with you. 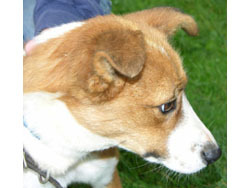 Keshi is a medium sized 8 month old male mixed breed dog. He appears to be part German Shepard and part something smaller. He stands about 17 inches at the shoulder, currently weighs about 30 pounds, and appears to be about 8 months old (has adult teeth but is still growing). He was given up by a family in NH who moved to WV. He is used to living in a house with a family and another dog, and is very sociable. He loves to play with other dogs and kids. He is close to house broken after only a week living inside, is comfortable in a crate, and travels extremely well in the car. He is arriving on Sunday, the 7th and will be quarantined for 2 days, issued a new health certificate and will then be available for adoption. UPDATE! 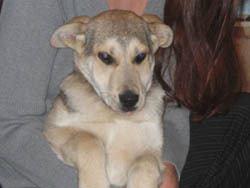 Kiva is a five month old shepherd/husky mix female pup who came up from WV on 1/7 and will be available after 1/9/07. She was originally in a family with a 3 year child but after further evaluation, we would not place her with children as she's a bit "over the top" for children. She is extremely dominant with puppies her age and that could easily transfer to household members. She's best with dominant dogs older than her, otherwise she will bully dogs her own size or smaller. This is a dog desperate for training and attention. She responds well to training and has calmed down a lot since her arrival, but she's definitely a dog who needs a strong leader so an experienced adopter who understands dog training would be the best option for her. She does not like being crated (could be the husky in her), but can't be left unattended at this point in her life so will need some positive experiences in the crate and/or lots of time with her person outside the crate working on training. She is much more accepting of the crate than when she first arrived. She would do best in an adult home where someone is home most of the day. 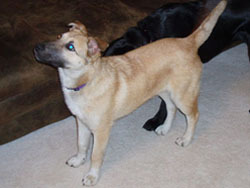 She will be at the Meet and Greet at Petco/Natick from noon until 2 on Saturday, 1/13/07. 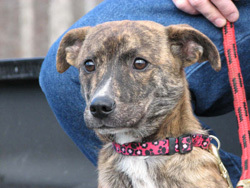 Merry is a five month old female brindled female mixed breed pup who seems to have some terrier in her as well as something small, like Basenji or Jack Russell. She only weighs 20 lbs and is 7 months old so she's not going to be very big. She's totally adorable. She was to be a Christmas puppy, hence her name, Merry. Here's the story on her. Dr. Amy from WV had brought the puppy back to the clinic because someone had wanted one for Christmas.The next day they called to say they decided they didn't want her, they wanted an older australian shepard. Since she didn't have anyone else interested she said she would have to be put down on Friday before Christmas. THANKFULLY a rescue worker was bringing a dog into the clinic for Dr. Amy to spay and they showed him the puppy. He said the rescue group would take her. The answer to everyone's prayers! Anyway, she's been staying in a foster home. She is such a sweet little girl. I'm guessing she's about 5 months old and weighs about 20 lbs. She was spayed on the 28th. She's good around cats and other dogs. She needs an experienced home who will keep her forever as brindled dogs and pit bulls are not dogs to end up in a shelter and she already almost lost her life once, so let's give her a chance. Please be her forever Mom or Dad, not someone who is going to move in a year or two or have a baby and give her up. We see it all the time, so we just want the best for this little girl. She has started her crate training and already knows how to sit and at times shake. :) Merry will be at our Meet and Greet on Saturday the 13th at Petco Natick from noon to 2PM. 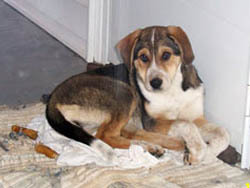 Nowell is a young small female Beagle/Aussie mix. She is quiet and very people-focused. 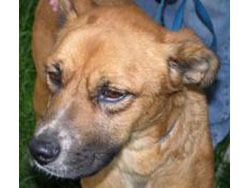 She was a WV dog who is coming up on 1/7/06 and will be available after 1/9/06 after her health visit with the vet. 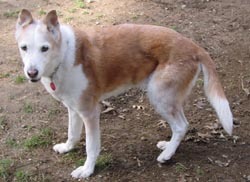 Penny is a sweet ten year old female collie mix who lost her home when her owner went into assisted living. She lost her home again when the relative who took her was diagnosed with cancer. She is a good girl who is well house trained and does not have accidents or get into your stuff. She has always been an only dog, so might be happiest with all the attention, but she seems to get along with other dogs. She was not socialized with cats and is very curious about them so possibly might want to be in a home without cats. She is an "easy keeper" and would make a wonderful companion for someone who wants a house dog. 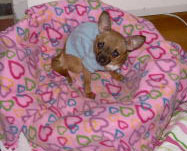 Pumpkin is a pup who underwent surgery on 1/11 for a luxated elbow. There was too much damage to the bone so the surgeon had to amputate her front left leg. We're looking for the right home for this beautiful pup. She's a sweet 4 month old puppy who deserves a chance. She was probably hit by a car. She already walks and runs like there was nothing wrong. She will need some ongoing rehabilitation work. At this point we're using a combination of conventional and alternative medicine on her so that she has the best chance of a healthy life. She will not be at the meet and greet this weekend as she is recovering from surgery. 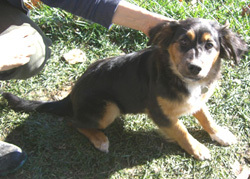 Rosie is a 5 month old Collie mix who was a WV stray. She weighs around 28 lbs. She is arriving on Sunday, the 7th and will be quarantined for two days, then seen by our vet and given a new health certificate. We will be showing the dogs on Saturday, Jan. 13th from noon to 2 PM at Petco in Natick. It's best to fill out an online application before you come to the event so that we can have the printed copy waiting to review with you. Sadie is a 12 week old black lab pup who was found living underneath a trailer in WV. She is labby through and through, loves the water, will drink it before it reaches the dish when you're pouring it. She loves playing in the rain and will be a real water dog. She is also extremely gentle and sot and cuddly. She will grow to be a big dog. Training is required for all our dogs. 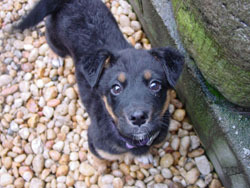 She will be at our Meet and Greet at Petco in natick on Saturday, 1/13/07 from noon until 2 PM. 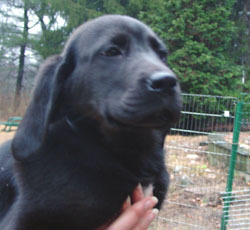 Sara is a 12 week old black lab pup who was found living underneath a trailer in WV. She is labby through and through, loves the water, will drink it before it reaches the dish when you're pouring it. She loves playing in the rain and will be a real water dog. She is also extremely gentle and sot and cuddly. She will grow to be a big dog. Training is required for all our dogs. 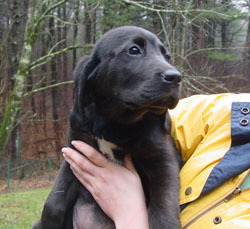 She will be at our Meet and Greet at Petco in natick on Saturday, 1/13/07 from noon until 2 PM. 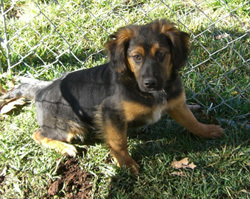 Sugar and her sister Spice came to us from WV where they were picked up as strays. They are approximately four months old and are very shy when you first meet them. They are acclimating well in the foster home and will be at the Meet and Greet on 1/13/07 at Petco in Natick from noon until 2 PM.